ME 340-2 or consent of instructor. Use of computers to improve productivity and reduce cost in manufacture of discrete parts and assemblies. 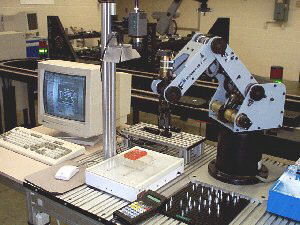 Manufacturing automation: sensors, actuators, and computers for automation; principles of computer control; programmable logic controllers; robotic devices; assembly automation. The course is aimed at advanced undergraduate and first year graduate students who are interested in the most frequently used technologies and methods for automating manufacturing and assembly operations. ME, MfE, IE, and EE students have generally taken this course. The course offers a blend of practical skills and a basic understanding necessary for an engineer to be able to address an array of automation tasks such as process/machine monitoring, execution of controlled motions, programming and integration of sequential controllers and robotic devices into complex systems, etc. The course is structured around weekly lectures that introduce the theoretical basis and extensive weekly laboratory exercises in which students, in a hands-on environment, learn the pragmatic implementation skills. Select and implement digital/analog sensors and actuators for different assembly and manufacturing tasks in conjunction with real-time control computers. Develop program code for real-time control/monitoring applications. Design and implement simple stepping - or DC-motor based motion control systems. Analyze and program articulated robotic devices. Design, program, and implement sequential logic control tasks using PLCs. Perform system integration to solve complex assembly tasks. In general, performance evaluation will be based on weekly problem sets, laboratory participation and reports, a midterm and a final exam. All exams will be open book and open notes. However, keep in mind, assessment strategies do vary by instructor. Systems Approach to Computer Integrated Design and Manufacturing, N. Singh, John Wiley and Sons, Inc., 1996.